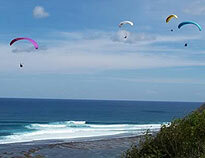 Paragliding is the simplest form of human flight. 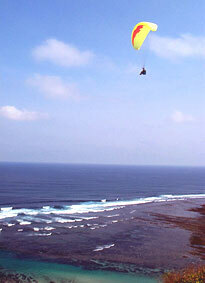 A paraglider is a non-motorized, foot-launched inflatable wing. It is easy to transport, easy to launch, and easy to land. 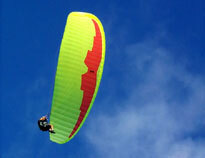 The paraglider itself is constructed of rip-stop nylon from which the pilot is suspended by sturdy kevlar lines. The pilot is clipped into a harness and oriented in a sitting position for maximum comfort. With a paraglider, you actually fly like a bird, soaring upwards on currents of air. Paragliders routinely stay aloft for 3 hours or more, climb to elevations of 15.000', and go cross-country for vast distances. Most people think that learning to fly a paraglider is a difficult thing to do and in fact, it is really quite easy and safe. 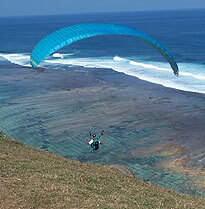 You can make paragliding, like most adventure sports, as safe or dangerous as you want. It is of course crucial that you receive instruction from a certified professional and use safe equipment - professional schools will create as controlled a learning environment as possible. But paragliding is still an outdoor sport and Mother Nature is unpredictable - the primary safety factors are personal judgment and attitude. You must be willing to learn gradually and to think with your head not with your ego. If you don’t, then you can get injured or killed; if you do, then you can paraglide until you’re 90. Paragliders are designed to soar. The duration record is over 11 hours and the distance record is 300 kilometers. In training you will start out just skimming the ground. As you progress and become more skilled and confident you will probably want to go higher and use the wing for its designed purpose - soaring! Average recreational pilots, utilizing thermal and ridge lift, routinely stay aloft for 3 hours or more, soar to altitudes of 15.000' and travel cross-country for great distances. In addition, paragliders can be easily carried and launched off of most mountains. Paragliding is the simplest and most serene way to fulfill humankind’s oldest dream - free flight! The pilot jogs down a gentle slope and glides away from the mountain. There is no free-falling or jumping off of cliffs. The launches and landings are slow and gentle and, once in the air, most people are surprised by how quiet and peaceful the experience is. Even a fear of heights is rarely a factor, as there is no sensation of falling. The solo lesson requires more effort (physical and mental) than the tandem lesson, but it lays the basic groundwork necessary to become your own pilot. If the idea of watching the sunset from a comfortable seat in the air, supported by the buoyant evening air, with perhaps an eagle or hawk joining you off your wing tip, appeals to you, then paragliding is for you.